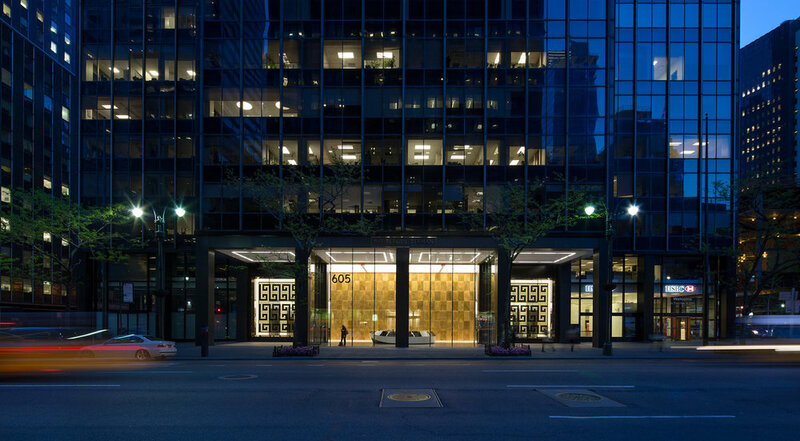 605 Third Avenue's new design teeters between corporate restraint and contemporary culture, creating a playful yet bold new identity for 605. Architectural materials respond to its changing environment and simultaneously create a spectacular digital art platform. Inspired by kaleidoscopes and the concept of transforming an everyday view into a digital art piece, we designed two digital glass windows for the entryway. The windows are a public artwork that constantly transforms the lobby experience, revealing an immersive experience that surprises and inspires. In the back of the lobby, we embedded two digital portholes, creating an ever-changing moment for 605’s private tenants. Each porthole pulled real-time content and generatively transformed it into a kaleidoscopic pattern. This intimate and playful digital gallery rotated every morning, creating delight and wonder for tenants. We created transformative, artistic, threshold experiences that bridge the buzz of public streets with the intimacy of a private interior through form, movement, and content.